Checkland Kindleysides isn’t your average design studio. In fact, the company thinks of itself as a ‘studio of possibilities’ helping brands engage with consumers. This is not about the ‘store’ as the four walls and basic transactions that it used to be. 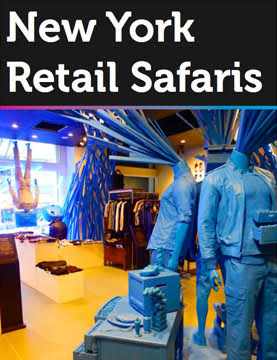 As a result, Checkland Kindleysides has been behind some of the most interesting brand retail spaces of recent years. Can you describe Checkland Kindleysides’ approach in a nutshell? We describe ourselves as a studio of possibilities, creating work that inspires both brands and consumers to engage with each other in original and rewarding ways. In a creative sense we’re open minded, never assume the answer is an obvious one, always looking beyond our brief to see the outer reaches of what’s possible. What are some of your standout projects? We tend to work with pioneering brands and companies that have a vision. They can be tiny or big, it doesn’t matter, but they’re pioneering in their field. One of our most interesting recent projects is the American Eagle space in Las Vegas. It’s arresting. It’s essentially a massive plywood box inside a steel framed box which has an entirely digital exterior. This means the outside can become different things from a NYC Soho building with windows and fire escapes to waves of indigo pouring down and illusions of the building itself literally changing shape. The American Eagle Studio space in New York is the kind of project that shows where retail is going. Being relevant and local, creating a meaningful community and importantly places that offer more than just transaction. This thinking opens a lot of opportunities. The store is located next to a university, so the experience is tailored around that, creating a place of true community. The social media team site in the store next to the washing machines which have been installed for the students to use for free. Our work with Joseph Cheaney & Sons was about changing perceptions. It’s reimagining the idea of craft and tradition into something forward-facing without losing any resonance of the brand’s lineage. What all these projects have in common is that they’re about pulling the outside in and pushing the inside out in terms of community, connectivity and engagement. Yes, it’s about filling gaps, opening opportunities and creating relationships. I think it’s about brands expressing themselves in different ways. What are the ingredients that make you go to the store? At one end it’s all about convenience, knowledge and fulfilment. You have the supermarkets where technologies like AI, facial recognition, mapping etc are going to make the experience of being in those spaces as quick, convenient, fulfilling and knowledge rich as possible. At the other end of the spectrum it’s still about convenience and knowledge, but a different interpretation. Stores have to offer levels of these things that just can’t be experienced on line; unique levels of privilege and knowledge that drives engagement and reasons to revisit physically. Our work for Adidas Originals achieves this, the thinking was about the idea of space as malleable and flexible, somewhere to meet people, be entertained and be highly informed, being with likeminded people. The physical store landscape a complex mix of things. There’s no one approach – but one thing is for sure it now must be about more than a straight forward transaction. Retail is the last bastion of some form of community. There’s collectively a bigger thing to be thought about there in terms of shops as places in our lives. 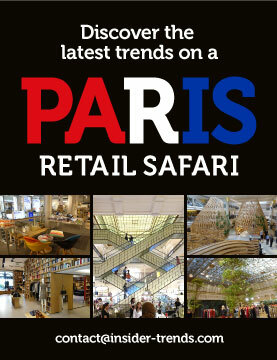 What is your take on the future of retail space? Retail has been played by a set of rules that have evolved slightly but have been much the same since time began. Online-only retailers are beginning to manifest themselves in some form physically which changes the rules entirely and brings new thinking to the idea of what it is to shop. We’re only seeing the beginning of that but that thinking about space in an entirely different way brings a new brave dynamic to it. At the moment it’s too much for some high street retailers just to keep their heads above water to do that. You have to give people reasons to visit more often and stay longer. Customers have to be able to engage in ideas, enjoy a dialogue and enjoy their interests. Independent retailers have long offered that. A sneaker store run by someone who is the local expert provides a reason to go in and have a dialogue. I think tech can also liberate the time and knowledge of people working in-store, so that their expertise can be currency. Customers can learn something they can’t learn elsewhere including online. They can have that dialogue that keeps them coming back. Retail has always been split between people who go into it for a career and become retail director etc and people who go into it as a transition to something else. If the future of retail is about excitement, experience and knowledge, then you can’t have that dialogue with someone who only knows what they read off the ticket. 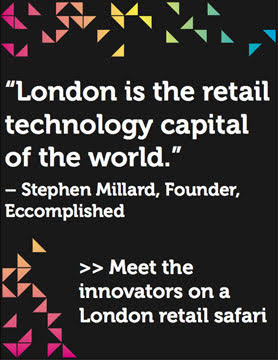 Also, what is the future of collective retail? For department stores to change perceptions, functionality and behaviours in spaces that may be hundreds of thousands of square feet requires a huge amount of money, and won’t affect the whole estate. I think it’s interesting to think about a high street community of retailer and brands collectively deciding on the environment, streetscape, how to share certain costs etc. Has the brief from clients changed compared to 5+ years ago? It’s evolved. There’s an understanding about a need to drive connectivity and community. Brands open up a world of something else to you and you participate in that. There’s a lot around how to do things in-store to connect with the outside world. This ranges from the simple selfie space to engaging people with higher levels of privilege that allow them to do different things. Some are setting themselves apart by privileged product or prototypes or customisation – people want to feel part of something beyond the norm. The way we design stores, merchandise product and connect it with other things around that engage are all naturally trying to get the store to equal levels of malleability with online which is always live. The question is financially and practically how do you make all that work? I think there’s an opportunity around broadcasting. Multiple dialogues with common threads that are connected to everything else a brand is doing is powerful. The smallest space with the biggest message can become the loudest voice. Do you think that the store and mobile will become more closely linked in the future? But where does it become intrusive and where does it become distracting? This is where Apps are set to be the empowering interface with the store, enhancing the physical experience and ability to go deeper, learn more and seek guidance. 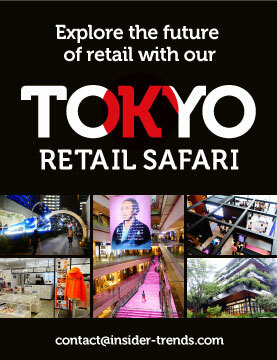 And this is an exciting dimension in interaction and discovery where shoppers can get responsive service in store, explore looks, request store staff, book fitting rooms, reserve product and instantly check out through scan and pay stations. It also offers shoppers levels of privilege through subscriptions and memberships where services and experiences are enhanced in store to those who want more dialogue and involvement all enabled via the mobile app. What is the future for Checkland Kindleysides? We’ve always had a pioneering spirit, it’s how we started. All we see is opportunity to embrace and pioneer the future through continual and now accelerated change. The days of thinking creatively in siloed disciplines are gone, we think across every creative boundary collectively, because the future is seamless. Collaboration brings possibilities and we see the future clearly in how we want to help our clients and the likeminded people we want to create amazing things with. Get more inspiration with our pick of 50 of the best visual merchandising approaches out there. 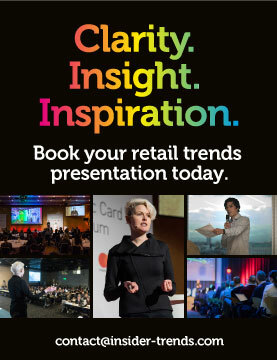 Or just want to go straight to the hottest retail technologies, latest disruptive thinking and simplest new ways to lower costs and boost sales? Transform your team’s thinking using Insider Trends’ little black book. Find out how here.